Emily Graham, aged 6, speaking in front of Carlisle City Councillors. A six-year-old climate change campaigner made a plea for Cumbria's community leaders to help protect the planet. 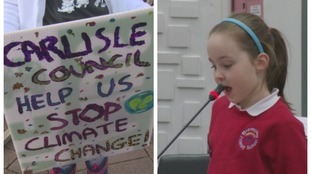 Emily Graham spoke in front of Carlisle City Councillors before the authority debated to declare a 'climate change emergency'. She hopes to one day be a councillor so she can help make a difference for her generation.